Apparatjik released their first album "We Are Here" on 14 June 2010. The CD comes in a card digi-pak. 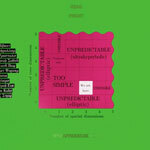 The front of the cover is white with part of a graph divided into purple, green, red, blue, yellow and white rectangles. Each rectangle has random words printed in black. "Number of time dimensions" is printed up the y-axis and "Number of spatial dimensions" along the x-axis. The back cover is pink with the outline of a circle in white plus the text "This space is intentionally left blank" printed across the middle. The left-hand side of inner sleeve is white with a red square, inside which is a white rectangle with the tracks printed in white and black letters over some black rectangles. The right-hand side features another graph design with area under the graph coloured yellow and above the graph coloured blue, pink and white with a "We are here" arrow. The y-axis has the text "Strong coupling constant" and the x-axis "Electromagnetic coupling constant". Inside there are two discs, a CD and a DVD. The CD is black one with a red circle towards the to[ with a smaller white circle inside. The text is printed at the bottom in silver. The DVD is blue and white striped with smaller red and black and solid black circles. The text is printed in silver and red at the bottom of the disc. The DVD features some live material and random clips of the band. The album is also available on vinyl LP. The cover is green with graph design in the centre with a pink background and words printed in black plus "We are here" printed in black on a white square. 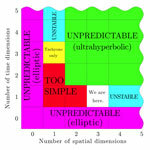 "Number of spatial dimensions" is printed along the x-axis and "Number of time dimensions along the y-axis. "HEAD" and "FRONT" are printed at the top of the sleeve and "Apparatjik" inside H1 tags at the bottom. Down the left hand side are some greek words printed in white on a black background. The album is also available for digital download. Apparatjik - We Are Here ?